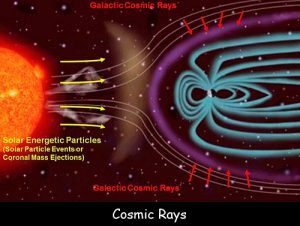 Cosmic Rays can be defined as high energy subatomic particles which originate outside our atmosphere and keep bombarding the earth. Most of them consist of single protons. A few consist of helium nuclei and just one percent consist of electrons entirely. These rays sometimes come from the Sun but mostly from a far universe somewhere outside the Solar System. The rays coming from the Sun are categorized as the lowest energy rays, which from outside the Solar system are classed as Galactic Cosmic Rays. 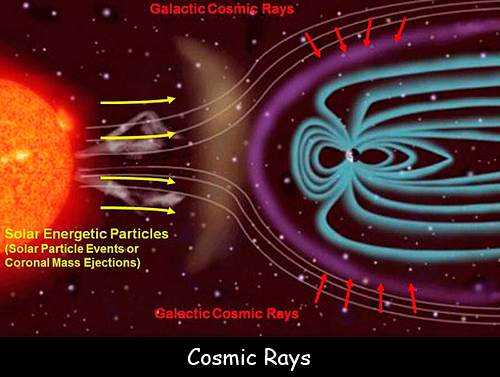 The rays that originate in the Milky Way are medium-energy cosmic rays. Cosmic Rays fly through space at incredible speeds nearly equal to the speed of light. Some of them are energetic enough to defy explanation. Most of the cosmic rays decay long before reaching the earth’s surface. A phenomenon known as the GZK limit states that the rays cannot be coming from farther than 30 million light years away. The exact reason why these rays are triggered is still not known. Some scientists relate their origin to supernovas. The rays represent a significant component in the energy balance of the Milky Way. Their existence was first discovered in 1912 by an Austrian-American physicist Victor Hess. He performed several experiments using an instrument called an electroscope and concluded that radiation comes into our atmosphere from outer space. When these rays enter our atmosphere they hit other particles like oxygen and nitrogen molecules. Cosmic rays constantly rain down on earth but by the time they reach us it becomes almost impossible to trace where they have come from. Declan, Tobin. " Cosmic Rays Fun Facts for Kids ." Easy Science for Kids, Apr 2019. Web. 23 Apr 2019. < https://easyscienceforkids.com/cosmic-rays/ >.